Description: A coal drag and a unit train of autoracks pass next to the yard adjacent to Baltimore Street crossing. Traffic on I-68 passes overhead. Description: Eastbound stacktrain over the high line at Walnut Street. Description: CSX 5495 leads 5401 east just outside of Wellsboro. Description: rolls through ashland in this shot just about as darkness falls. Description: Last minutes of light and a wet snow falling. Description: Hollow Road, 1631 hours. Description: CSX Q108-14 is at Lloyd Rd. In the background, and in the haze, you can see a building of the Cleveland skyline. Description: The first four units on a seven unit consist of Q117, lean into the Super Elevated curve at Short Line Junction. Description: After waiting for nearly an hour, Q123 finally heads south. The entire hour of sitting, 5495's brights were on. 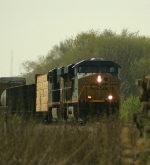 Description: Q226 rolls east down the Sand Patch grade. Description: Q174 Eastbound thru Riverdale. Description: CSX Q117-28 blows past the Conneaut Rail Historical Museum, on a humid summer afternoon. Description: Eastbound on the ex PRR / Conrail high line.